Second graders are polishing a wide range of basic writing skills, including writing legibly, using capitalization and punctuation correctly (most of the time! ), and moving from invented spelling to more accurate spelling. For most, handwriting becomes automatic, so they can concentrate more on the content of their writing rather than on the mechanics. Second graders can organize their writing to include a beginning, middle, and end. 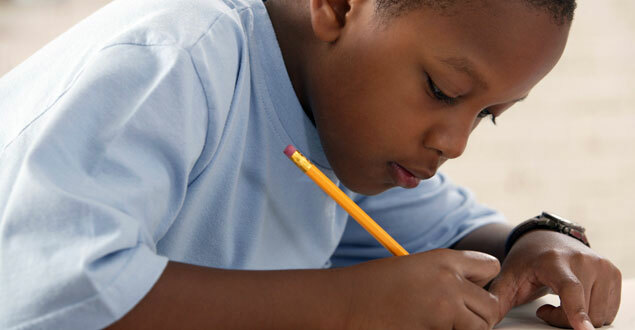 They can write a simple essay with a title and introductory sentence, provide examples and details that support their main concept, and write a concluding sentence. A second grade boy wrote this story in a writing workshop where he was given free choice of topics. He is writing about a dog from a movie he has seen. He has generated an idea to write about that he knows a lot about. He sticks to the topic. He uses conventions such as capital letters and ending punctuation for all sentences. He experiments with interesting words ('defeats'). Bolt is a dog. Bolt is white and grey and black. Bolt has two ears. Bolt has powers. Bolt barks all day. Bolt defeats evil. Bolt trains all day. Bolt lives at home. What does this child need to learn next? Teaching students how to use sentence combining to create one long, descriptive sentence from two shorter ones. Teaching students to replace names with pronouns instead of using the same name repetitively throughout the story. Teaching students to choose one or more sentences and focus on telling more about that sentence to expand stories. In this case, he might choose the sentence "Ballt have powers" and give examples of when he uses his powers. Teaching students to narrow their focus by choosing just one favorite sentence from a story and making that a first sentence in a new story. 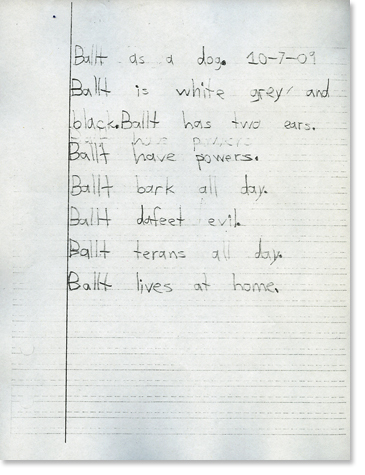 This writer may choose 'Ballt dafeet evil' and write a different story about just that sentence.